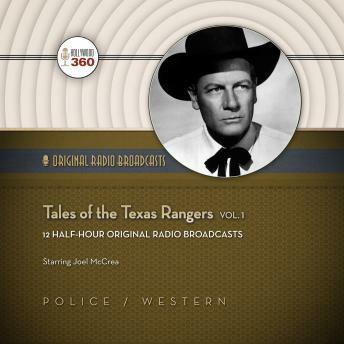 Like its predecessor, Dragnet, Tales of the Texas Rangers adapted actual police cases for its broadcasts. Leading each week’s investigation was Texas Ranger Jayce Pearson, portrayed by movie star Joel McCrea. Because the stories were set in the present, Pearson used the latest scientific techniques to identify criminals. Unlike Joe Friday, Pearson didn’t have a regular partner, typically working with the local sheriff instead. Working environments would range from big cities to isolated wilderness areas that could only be reached on horseback. Produced and directed by Stacy Keach Sr., Tales of the Texas Rangers ran from 1950 to 1952 and featured radio’s top supporting actors. Its popularity spawned a 1955 Saturday morning television series starring Willard Parker and Harry Lauter broadcast on CBS until 1958.